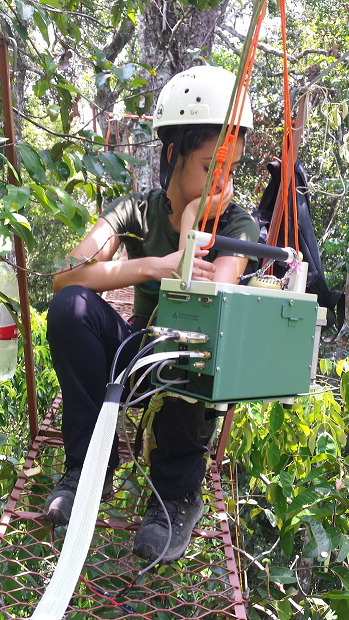 Team member Maquelle Garcia takes measurements at the top of the tree canopy (photo courtesy of Dr. Domingues). This project will generate novel understanding on the diversity of plant traits related to water use and photosynthesis. The functional diversity present in a given community is a key dimension of biodiversity that effectively modulates how forests respond to disturbances, such as logging, precipitation, and temperature extremes or the increase in carbon dioxide concentration. It also determines the extent of the feedback between forest and climate, therefore informing us on possible consequences of forest mortality or land use change. To better predict the resilience of the forest and its capacity to provide ecosystem services, it is essential to evaluate the current spectrum of functional diversity, still a major unknown component in biodiversity research. Dr. Domingues and his colleagues will use a new approach looking at the carbon and water cycles as fundamentally coupled at both the leaf and tree level. In order to achieve a qualitative and quantitative assessment of water and carbon strategies by Amazonian trees, they will continuously monitor both the transport of water in tree trunks and the continuous expansion and contraction of the tree’s bole diameter, which relates to water storage, mobilization of photosynthetic products, and growth. This will be complemented by leaf-level measurements of photosynthetic apparatus and hydraulics to comprehend the individual link of photosynthesis with water usage. This novel dataset will demonstrate the coupling between transport of water and carbon within trees and how it relates to forest productivity. The new data will be applied to broader scales by using land-surface and ecosystem models to simulate the interaction between forest and atmosphere at different scenarios of functional diversity. This step will be achieved by collaboration with U.S. Government-supported partner Pierre Gentine, who is implementing a soil-plant-atmosphere-continuum model able to reproduce the carbon and water relationship in the Community Land Model. Brazilian students will also receive much-needed training in computational modeling. The proposed research will shed light on the role of biodiversity not only in maintaining and improving quality of life for inhabitants of the Amazon region but also for improving water security in other areas. By characterizing current variability in water and carbon use strategies expressed by Amazonian trees, it is possible to assess how much biodiversity loss within this group is tolerable, without seriously compromising ecosystem functioning. The information to be generated by this project will help in evaluating ecosystem integrity in areas where disturbance has already occurred. For example, it will be possible to assess disparities between pristine forest and secondary vegetation, in terms of ecosystem response to water stress whether from bottom up (soil to leaves induced by dry soil conditions) or top down (from leaves to soil induced by dry or hot weather conditions), according to species composition of the community. As a result, plant communities can be evaluated in terms of resilience to further climatic extremes. The products of this research will also aid in guiding species selection for vegetation restoration efforts. For example, such information will be of great value to local community initiatives focusing on production of tree saplings for reforestation programs or ecosystem improvement actions. Project members Maquelle Garcia and Sabrina Garcia continued their busy schedule of data collection at their field site during the last quarter of 2018. Sabrina submitted a proposal for a special symposium for the next meeting of the Association for Tropical Biology and Conservation (ATBC) regarding long-term field experiments in the Amazon. Meanwhile, Maquelle is advancing quickly in her PhD work. A new female Master’s student is being recruited to develop her research at the study site, focusing on photosynthesis. Some difficulties were encountered at the field site when some of the sap flow sensors and automated dendrometers (treehuggers) were damaged due to lightning strikes or other weather conditions. As of January 2019, they had been taken back to the PI’s lab for inspection and repair, and they are expected to be returned to service in February. Dr. Domingues will be visiting the field site February 4-16 for the sensor reinstallation and collaboration with his research team. They plan to submit abstracts on their work for presentation at the to be presented at the next ATBC meeting coming up in July/August 2019. The PI also tentatively plans a visit to his U.S. partner Dr. Gentine in New York in July. A no-cost extension has been issued through October 2019 to give the team the additional time they need to complete their project.